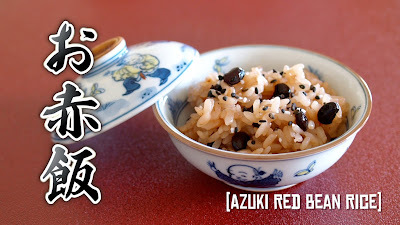 This video will show you how to make Osekihan (or Sekihan) Azuki Red Bean Rice. It is a festive dish served on any festive occasion, such as birthday! 1. Put Azuki and water in a pot and bring to a boil. Then simmer for 3 minutes and drain. Place the Azuki in a pot again, then add 200ml water, bring to a boil, and cook on low for 15 minutes. Drain and save the cooking liquid. 2. Wash and place the Mochi rice in a pot. Add water in the cooking liquid up to 200ml, add it into the pot, then add water to the appropriate level indicated in the pot, add 1/2 tsp. of salt (to make it tasty), and mix well. 3. Spread the Azuki on top (do not mix or the rice won't cook well), then place the pot into the rice cooker. Cover and press the button to start. 4. When it's done, toss the rice lightly using a rice paddle, serve in a dish, top with Gomashio.